2,379 km of bicycle travelling from Olbia in northeastern Sardinia (Italy) to the islands south along the eastcoast, following the westcoast to the north, via ferry to Corsica (France), along the islands westcoast to the north, crossing inland to the southern tip of the island and along the eastcoast to the northern tip, hopping over to Elba (Italy) by ferry from Bastia, around the island and then by ferry to Italy´s mainland, exploring Tuscany and ending in Pisa. 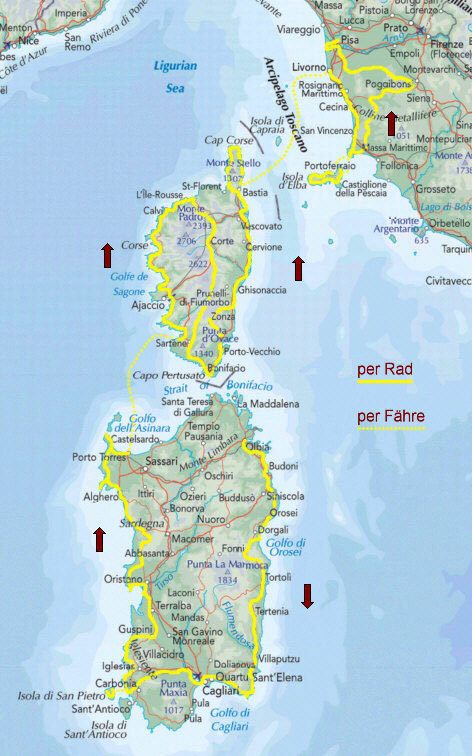 Do you like Cycling Sardinia & Corsica? 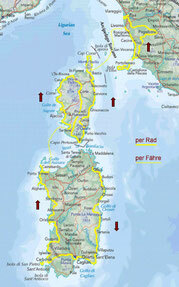 Share Cycling Sardinia & Corsica! Unfortunately no travel report in English available yet. Below the German report translated by Google Translate. Sorry for the partly weird and bizarre English! Proper translation is coming within the year 2018! (955 km) We landed in good weather at the Olbia airport in the northwest of the Italian island of Sardinia, packed our bikes and bags in front of the airport building and cycled south, always along the east coast of the island. On the S125 the traffic at the touristy Costa Smeralda was initially very dense. In the Cala de Budoni we jumped for the first time in the crystal clear and warm Mediterranean, before continuing on smaller side roads to Siniscola over to Orosei. uphill to almost 1,000 m altitude. Passes Passo di Silana and Genna Cruxi continue to Altopiano Su Golgo and down to Baunei. At some distance from the sea we cycled further south in the next few days. Most of the time we stayed somewhere in the tent in the wild. A sheltered spot was usually found without any problems. We turned south on Muravera on a small gravel road to Capo Ferrato, before we cycled past the very tourist Costa Rei to the southeasternmost point of Sardinia, the Capo Carbonara. In Torre delle Stelle we went to dive for two days at Manni's diving center, before we fought our way through the little-known Greater Cagliari via motorways and busy expressways. We left the southernmost point of the island and cycled over Villamassargia over to the west coast and took in Portovesme the ferry to the Isola de San Pietro, where we enjoyed sun, beach and sea. It was pretty steep across the small island to the south and the west coast, before we again took the ferry back to Sardinia. We followed the small coastal road partly steep and exhausting north to Portixeddu, where we forced to turn back into the interior. First up and down, then flat over Terralba back to the sea at Marina de Arborea, where we pitched our tent after jumping into the sea in a nearby forest. About the less spectacular Sinis Peninsula, it went to the overcrowded Capo San Marco and then over sandy and gravel roads very nice along the sea along the north to lonely beaches. We snorkeled and bathed, but let tents prefer to stay because of numerous checkpoints and police patrols. Via Cuglieri we continued north on the west coast and via Bosa on the spectacular coast road to Alghero with magnificent views over coast and sea, but with no possibility to build a tent hidden away, so we camped in the campsite in Alghero. About the Cap Caccia with breathtaking views, we drove past great grottos with even better admission prices and by heat sweltering it went to the northwestern point of Sardinia, the Torre Pelosa, behind which you could see the Isola Piana and the subsequent barren, former prisoner island , It was nice but quite crowded with tourists so we drove back and headed east to Porto Torres. Due to time constraints, we skipped the north-eastern tip of Sardinia and took the ferry to Corsica. (943 km) In hindsight, we should still be annoyed to have taken the much more expensive ferry, as there would have been enough time to cycle to the cheaper ferry in the northeast of Sardinia. But so we landed in the port of Propriano, where, unlike in Sardinia, threatening clouds greeted us. After a night at the campsite and a breakfast with fresh French baguette we started cycling. It went on, as on the entire remaining stretch of this island, always uphill or downhill and so we pedal on the D157 along the Golfe de Valinco to the north. Over some gradients we went to the Golf d'Ajaccio and on beautiful route to Ajaccio, although forced on the last piece on the highway. On the D81 we went further north along the west coast of Corsica on the Golfe de Sagone over beautiful route over Cargèse and the next day by light drizzle on to the Calanche de Piana, which we luckily reached again in bright sunshine. Through impressive rocky landscapes with countless photo opportunities and breathtaking views, it continued on a spectacular road to Porto and steadily uphill to Osani. Passing the Golfe de Galéria, we continued on a bad but scenic and hardly busy road north to Calvi, where we followed the coast further northeast to the Ile Rousse, which was completely overrun by tourists connected by a bridge with Sardinia , We saved ourselves the hustle and bustle, drove on to Lozari and turned south the next day inland. After a night with a mouse visit to the tent we drove on the N2197 in low traffic and nice weather up to 650 m and via Ponte Leccia back to the N197, where the traffic was noticeably denser. Via Corte we pedaled through the middle of the island southwards over steep and heavily used roads uphill and downhill in quite a heat. But the landscape was beautiful and at Vivario we finally turned back onto a side street. Practically without traffic, we drove on serpentines at an altitude of 1,311 m above the Col de Sorba, downhill via Ghisoni and after one night in the Foret Domeniale de Marmano back up over the Col de Verde over 1,300 m and on via Zivaco to the south. Moderately steep, but long uphill it went then strengthened with chestnut crêpes over the Col de la Vaccia at 1,199 m and endless curves long downhill and through a deep gorge down almost to sea level. Then we went uphill and downhill through Sartène to the south coast of the island, which we followed over smaller hills southeast to Bonifacio. Unfortunately, the very worth seeing place with its houses over spectacular steep coast and its beautiful old town was completely overrun with tourists and tour groups, so that we quickly made our way back to the north, always along the east coast. About Porto Vecchio, where we actually wanted to go diving again, but which was supposedly not due to strong winds, we turned again inland and drove on the D368 in scorching heat sweeping up to 1,000 m altitude. In particular, the last curves in the village of L'Ospédale had it in itself, so we were looking forward to a swim in the reservoir, but it was almost dried out. So we cycled through beautiful countryside north over Zonza and then over the Col de Bavella through spectacular landscape over 1,220 m altitude and through a long-drawn high valley with magnificent views of the famous Aiguilles de Bavella. On a bad road we cycled downhill again to the coast to Solenzara and then through the only real plain of Corsica to the north with much traffic over Ghisonaccia and Aléria along the east coast. Accompanied by thunderstorms with thunder and occasional showers we cycled further north and across the less busy peninsula at Etang Biguglia into the dense city traffic of Bastia. Since the next ferry to Italy should take only three days anyway, we made the tour around the Cap Corse, the northern, elongated tip of the island. Over the extremely steep D264 we struggled very exhausting to the west out of the city at 538 m and would have better driven the longer, but probably less steep D81. On the west coast of the Cap Corse, we turned north and after a stormy night we cycled on very beautiful and hardly traveled coastal road to the northernmost point to Tollare and then along the east coast again to the south on also beautiful, but not so wild and steeper Coast along back to Bastia. The next afternoon we lay on the sundeck of the ferry to Livorno and our really nice time on Corsica was over. (114 km) We cycled on the Italian mainland from Livorno on completely built coast along a boring route right next to a motorway along with much traffic over Rosignano and Cécina up to the ugly harbor town of Piombino, where we decided because of this sobering coastal landscape, the Ferry to take the Italian island of Elba. A short time later we took the cheaper ferry from Teramar to the beautiful harbor town of Rio Marina on Elba. After a detour to Cavo in the north we cycled uphill to the inland of the island over two mountain ranges and back down to the sea to Porto Azzurro. Uphill and downhill we went along the south coast to Campo nell'Elba and along a beautiful panoramic road along the sea over Pomonte in a curve to the north coast, up to 375 m at Marciana and back down to Marciana Marina on the sea. Here we went diving again, before we continued to Portoferraio, where we took the ferry back to the Italian mainland. (367 km) Back in Piombino we cycled on the highway-like 398 to Venturina and continue on little spectacular route over Campiglia and Suvereto slightly uphill and downhill. On the nicer 329 we cycled towards Castagneto and Canneto and Sassa further north to Ponteginori, where we again met a larger road and followed the 68 in significantly heavier traffic to the east. Shortly before Volterra we went in numerous steep turns uphill to 531 m altitude in the very beautiful place with a beautiful old town and narrow streets. After a terrific Italian ice cream we went downhill and further uphill and downhill east to Castèl San Gimignano, where we turned north and again cycled heavily uphill in the place to San Gimignano, rather than outside around the mountain, as you can almost everywhere otherwise in the world would do. We headed west and cycled over Péccioli, Terriciola and Casciana in a zig-zag course towards Greater Pisa. After the obligatory tour of the leaning tower of Pisa, we made our way to the west, as there was nothing else to see in the city, again to the coast to Marina di Pisa, where we said goodbye to the Mediterranean and then for the Camp site search back towards Pisa. After a night at the edge of a forest we cycled to the airport, grabbed with the friendly support of the airport staff in a storeroom empty boxes and even bubble wrap, packed wheels and luggage and a short time later we sat unfortunately already in the plane back home.